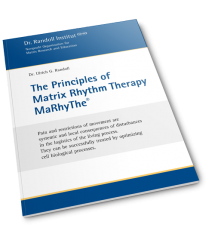 It’s that time again – a week of intensive workshops and exchange of experiences with other practical matrix rhythm therapists, basic researchers and clinicians. The participants’ desired and specific diagnoses of their therapy are reflected on cell biological regulation and linked to the systemic matrix concept. After developing the therapy strategy, the practical implementation takes place under guidance. First Thursday of every month we offer personalized trainings in small groups. We organize training courses, seminars and workshops with Dr. Randoll and his lecturing colleagues. The latest dates and programs are given here, together with information concerning registration. Beginning in 1998 a number of research projects were carried out, which produced important scientific results and insights concerning the Matrix Concept. In 2013 the Dr. Randoll Institute was founded as a non-profit organization. The human being is a complex system made up of approximately 70 trillion cells. Each of the cells is surrounded by the extracellular matrix. All communication and transport of substances between the cells, takes place via the matrix. There is no transit route to or from a cell which does not pass through this medium. The extracellular matrix pervades the entire body.